Most of us consider our baby's "firsts" and we rarely consider the "lasts". 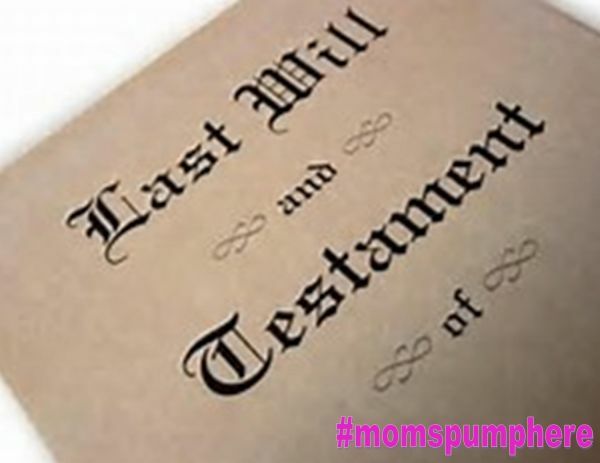 Today I want to address the last gift we will give our children, our wills and other estate planning documents. Yes, thinking about a will is uncomfortable and thinking about our children being here without us is even more uncomfortable. Many of us put it off and think we'll deal with it later, when we're older, when we have more time. Please know that we hear from several moms who want us to address this topic with you - the time is now to prepare this last gift for your children. What is a Will? A will provides specific instructions as to whom will receive your assets. Bank accounts, real estate, family heirlooms like jewelry and artwork and vehicles need to be allocated when you pass away. More importantly, a will designates who will care for your children if anything should happen to you and you are no longer able to care for your children. Why Should My Family Have One? As parents, a will is the most direct way to clearly define whom you would like to take care of your child(ren). You can designate someone to care for them if you pass away before they reach a specified age, and you can designate someone to handle your estate (money and assets) on their behalf until they reach a specified age. You have the freedom to choose the same guardian for your children and your property, or you can divide the responsibilities among several people. For example, you may want to have your sister and her husband care for your children, but have your brother and his family manage the financial portion of the estate until your children get older. Having a will helps to clarify these questions and leaves specific instructions for your loved ones and outlines your wishes. Which Other Documents Should I Consider? In addition to the will, a living will and a health care proxy are very important to also consider. A living will is a written statement that outlines your wishes regarding medical treatment if you should no longer be able to give your own consent. A health care proxy is a written statement which legally assigns this responsibility to another party so that they can legally make health care decisions on your behalf. Most experts recommend parents to have both of these documents, as the living will simply expresses your wishes and may not be honored in all states. The health care proxy legally assigns someone this decision-making responsibility on your behalf. How can I have these Documents Prepared? Some people are comfortable preparing these documents on their own, but the document should be typed or printed as only a few states recognize hand-written wills. The document must state that it is a will, and it must be signed and dated in the presence of at least two witnesses (who must also sign). Alternatively, a lawyer or legal service can help provide guidance and assistance in working through the process. I found the process to be very emotional and a bit overwhelming, so going through a company worked well for my family. They sent us a list of very specific questions that both my husband and I had to work through, and when we had our decisions made, the wills (and additional documents) were finalized within one week. The process of working through the will lasted almost three years for my family. Who do we pick to take care of the kids? Who gets the house? Who will help with the money and their college savings? The three years of saying, "I need to do this before something happens" were more painful than the actual process. Now I feel more at ease that my family knows my wishes, my children's guardians have clear guidelines for their care, and I rest my head at night feeling like I've done my best to provide them with their last gifts from me.